Plugs need testing. 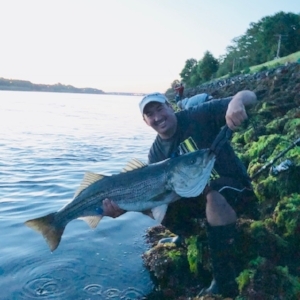 Anglers on our team exemplify what it means to be a conscientious angler. Not only do they fish hard, but they never take more than they need and are aware of how their actions affect the fisheries. Our Pro Staff encourage catch & release. Todd is a Native Cape Codder. He can be found fishing Cape Cod beaches anytime from May through November, but your best bet to find him is at the Cape Cod Canal. The Canal is where he officially caught the bug for chasing trophy sized Striped Bass. It has become more of an obsession than a hobby, but he wouldn't have it any other way! To ensure future generations can enjoy the same, he believes in Catch and Release and our responsibility to manage the resource of the Striped Bass that gives us some of our fondest memories with great friends. Born and raised on Cape Cod, Drew is a Native. He has been fishing since he was a wee lad. Year round you can find Drew wherever the action is hot. The Canal, the beaches, nearshore Tog, off shore Tuna, and Trout in the kettle ponds during the winter, he does it all. Drew is enthusiastic about fishing to say the least. His passion to fish is matched by the desire to conserve the resource, which is why he supports catch and release. Rob is a Navy veteran who grew up hunting and fishing in Maine. He currently lives in Pawtucket, RI with his wife and teenage daughter. These days he can be found fishing the Cape Cod Canal for big Stripers. Rob is also a strong supporter of catch and release in order to maintain a healthy fish population for future generations to enjoy. Pete was born and raised on Cape Cod. His passion for surfcasting borders on obsession. Twelve months a year he can be found along the waters edge with a rod, reel, and a camera. As a multi-species catch and release angler and accomplished photographer, Pete brings a unique view to the the PlugLAB team. Dan was born and raised on Cape Cod, growing up only minutes from the Canal and surrounding beaches. Raised in a family of Giant Bluefin tuna fisherman, Dan learned at an early age just how important conservation and protection of our amazing Cape Cod fishery is. Equally comfortable casting big plugs at trophy Ditch stripers, or on the deck of a center console chasing tuna with spinning gear, Dan is rewarded most by watching his catch swim away healthy!